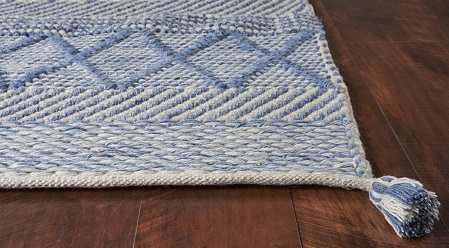 SOMERSET, N.J. — Kas Rugs is partnering with coastal lifestyle brand Hang Ten for a new line of rugs. Via Jewel Branding, Hang Ten is licensing its lifestyle designs into a variety of home categories, including rugs, home décor accessories, furniture and tabletop. “Given the rapid growth of Hang Ten in multiple categories, we felt the timing was right to enable our customers to experience the brand throughout their homes, making Hang Ten a true lifestyle brand,” said Marc Setton, CEO, Hang Ten. Malibu offers hand-woven chunky rugs constructed of easy-to-clean polyester that can evoke a California lifestyle or a bohemian vibe. The rugs feature a trendy color palette and corner tassels in an assortment of six styles and four sizes. Palm Beach presents simple yet polished hand-woven jute rugs in two looks: a chunky solid weave and a smoother, chic version with stripes. Available in four sizes and six colors. Sunset Beach offers natural jute and saari silk flatweaves with a boho look and feel. Offered in three colorways, these rugs come in five sizes, ranging from a 27-by-45-inch scatter size to a 8’6” by 11’6” rug. Hang Ten joins Kas’ licensing portfolio of lifestyle brands, which also include Libby Langdon and Bob Mackie Home. Kas Rugs will exhibit in Atlanta, July 10-14, in space 4-C-5 in AmericasMart and in Las Vegas, July 28-Aug. 2, in space B-175. Subscribe to our Rss Feed, or share this article with your friends! Katie is the Marketing Manager at Jewel Branding. Her favorite pastimes include anything Harry Potter, exploring Denver and creating typography and illustration designs.